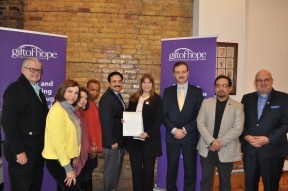 State Senator (D-Chicago) of the First District and Assistant Majority Leader, Antonio “Tony” Muñoz presented Gift of Hope, Organ & Tissue Donor Network with a historic proclamation instituting November 12th as Gift of Hope Awareness Day in the state of Illinois. The 28-year-old organization received this honor in recognition for its tireless efforts to save and enhance the lives of as many people as possible through organ and tissue donation. The statewide resolution supports Gift of Hope’s ongoing mission to inspire people to say “YES” to donation and start the conversation with their loved ones. Hugh Doran, Gift of Hope volunteer, Leda Santodomingo, Journalist & Producer, Jessica Aquino, Donation Specialist, Gift of Hope, Marion Shuck, Manager of Community Affairs, Gift of Hope, State Senator Tony Muñoz (D-Chicago), Raiza Mendoza, Manager of Hispanic Affairs, Gift of Hope, Carlos Olea, Hispanic Council Member Gift of Hope, Juan Zavala, Executive Director, Latinos por la Salud, Jaime Di Paulo, Executive Director, Little Village Chamber of Commerce.